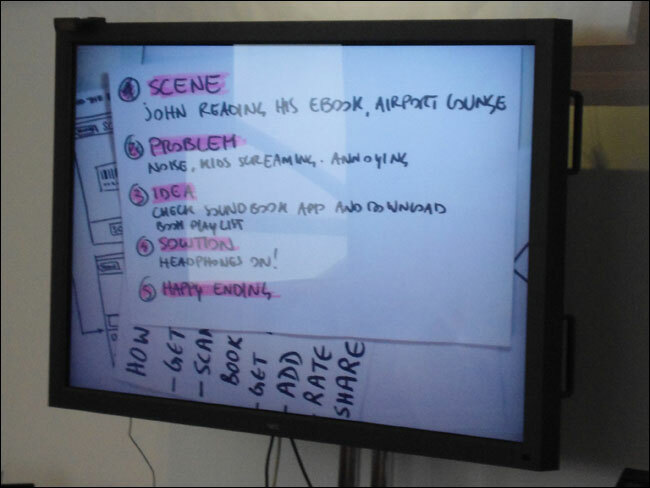 Martin Belam’s blog about UX, IA, journalism and digital media. Social reading experience – is there a way to build on traditional book clubs? Reading context – where are people reading, using dead trees or devices? If people are currently happy with their private reading habits and personal book discovery, then are these types of digital services attempting to engineer solutions to problems that don’t exist? Sound was involved in a few of the teams’ ideas - one being the “sonic reading environment”. Their use case was trying to read in a crowded space - for example sat down in an airport next to some noisy children - and being unable to concentrate. They conceived the idea of a Spotify-type service, where music wasn’t arranged by artist or genre, but was arranged by book or author. It played you music or soundscapes that were appropriate to the type of book you were reading. Another team had an idea for self-generating book soundtracks - not the tightly-scored music that goes with a film, but more of a “sound design” for a specific book. During the presentation this did feel a little bit like the team had been rail-roaded into working around an idea that one of the members had already been involved in. As part of their process they’d also discussed the idea of having “colour tones” in the presentation of narrative, where there were presentational differences depending on whether a passage of prose was pacy or scary or descriptive and so on. One project was to provide downloadable audio accompaniment to children’s books, so that weary parents could get some help at bedtime in pulling off the kinds of tricks that get children engaged in that environment - for example teasing them by veering off the narrative of a book they know very well. “And then an elephant appeared.” “No it didn’t daddy, that is a giraffe, don’t be silly!”. The idea had some similarities with the Ladybird Classic Me Books iPad app, which allows parents and children to record their own narrative and soundbites on top of books that the adult probably remembers from when they were learning to read. Quite a few of the use cases for the designs started with the user scanning the barcode to identify their book, and deliver digital content accordingly. I didn’t have the heart to tell anybody - after my experience with trying to model the books domain for the Guardian - that this way madness lies. One intriguing suggestion was to start embedding content in the transport infrastructure. To solve the problem of a lack of connectivity on many underground transport systems, an app would receive fresh batches of content when the user tapped in their Oyster card or similar type of electronic ticket. Market research on the London Underground suggested this would be an extremely popular proposition. The team thought of it as a way of delivering short stories and samples from new writers straight into your pocket - with perhaps different daily content on different underground or metro lines. I immediately thought of it as a news update delivery service. Another team also had an idea that involved hardware - the PaperByte bookmark. Driven by the idea that you don’t want the atmosphere, characters and experience of a book to end when you shut it, this bookmark used “some technology/magic technique” to determine where you were in a book, and deliver complimentary material direct to your phone or portable digital device. A bookmark that could effectively “do a Shazam” for the written word sounded a tall order, and I wasn’t sure quite what kind of content I’d want on the phone that would make me shut the book when I had access to both, but a “sentient” bookmark that did something good related with your book sounded great. He talked a bit about how one thing that distinguishes comics and graphic novels from any other narrative art form is that after every single frame “closure” happens, and the audience has to fill in the gap to the next frame in their heads. This means that you can’t tell it to other people, or perform it, in a way that you can with a novel. 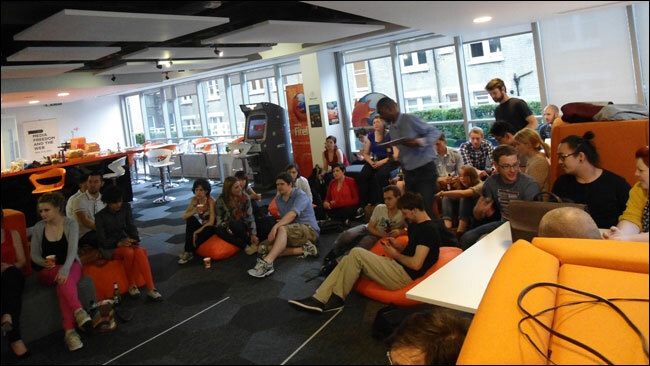 The venue for this design jam was the Mozilla Space in London. I’ve been using it as one of my bases for working at Emblem, and it is a brilliant facility. If you like remote working, and need a shared space with some snacks and drinks and meeting rooms, then you could do a lot, lot worse. Just don’t pinch my regular spot. By Martin Belam on 30 July 2012. I’m a designer and journalist, and I am Social & New Formats Editor at the Guardian. I’ve spent nearly twenty years building digital products for the likes of the BBC, Daily Mirror and Sony. I’m @MartinBelam on Twitter, and martin@emblem-digital.com on email. Sign up to get my blog posts sent to you via email. I’ve moved my blog to martinbelam.com, and you can find out more about me there. You can subscribe to updates via RSS and email, follow me on Twitter or ‘Like’ my Facebook page. This was Martin Belam’s personal blog. The views expressed are my own, and do not reflect the views of any current or former employers or clients. Privacy and usage of cookies.